A "griddy" game where dots become lines and lines become squares. The player with the most squares wins. Draw rows of dots, separated by a good half inch, in a grid of 10 by 10 columns. Each player takes a turn connecting one dot to another adjacent dot horizontally or vertically, one move at a time. After a while, the board begins to fill with a series of horizontal and vertical lines, some connected, some not. When a player draws a line that forms a square, that player fills the square with his first initial. The player, who drew the closing line on the square, gets another turn. The game is played until all the dots become boxes, and the player with the most boxes completed at the end becomes the winner. 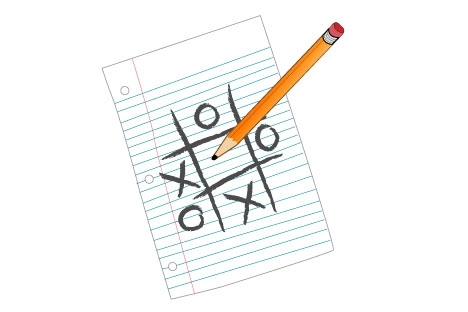 You can play Dots on more than just a rectangular grid; play it on a triangular grid or a hexagonal grid, with three-sided or five-sided boxes. Be as creative as you like.